I like fried, battered shrimp. Usually. So I thought I would try Louisiana Fish Bar in Fairmount (or Price Hill, I am not quite sure of the exact neighborhood). It is adjacent to and a part of Murray's Pub now, but I have never tried the pub. The fish bar is that tiny section on the far left of the building (when facing it). I had called in a pickup order and the lady on the phone didn't sound particularly friendly. When I arrived, I entered to find no cashier at the register, and a cook was lingering in the back just looking at me, then finally came up and said that the cashier would be back shortly. She finally came back, and seemed pissed at the world. I figured this was probably the same "unfriendly" voice I had heard on the phone when I called to place my order. She made me feel like I was inconveniencing her by coming to pick up my food. I thought maybe she was just that kind of person, not great with customer service skills, but then when I was paying I heard her cheerfully yell to a departing drunk customer that she would see him next time and a smile lit up her face. Ok, so she does know customer service, she just chose not to treat me well. I guess you have to be a regular around there to be treated well? Of course, like I said, I don't know how it is next door at Murray's, but the environment at the fish bar wasn't a pleasant one. All dinners come with grilled peppers and onions, french fries, and two slices of bread. They don't have a big selection on their menu, considering it is just a fish place. I ordered the 4 piece cod dinner and I was pretty excited about it. As I said, I am always looking for quality fried fish. Unfortunately, I didn't find it. The fish wasn't anything special (it wasn't bad either) but I wasn't a fan of the tartar sauce that came with it. To me, that's like having no peanut butter with your jelly sandwich, or having no butter for your bread. Tartar sauce is a MUST for me when it comes to fish. So that was a disappointment. And those fries underneath were just pure sogginess. Granted, they did have to survive a five minute drive back to my house. But these fries were just a sogfest! It probably didn't help that they bury them under the fish which may have also affected the quality of the fries. OR they just weren't cooked enough. Let's leave it at that. The fish did come with grilled peppers and onions which is a good idea at least. But they couldn't save the yucky tartar sauce and soggy fries. Overall I was just not very impressed. The food wasn't anything special, and the setting wasn't inviting. I definitely won't be back here again. It is hard for me to say that I would try Murray's.... because if the service is anything like that of the fish bar, I am better off not wasting the gas to drive to this place. Since this was my first week participating, and the photos are due no later than midnight tonight, instead of trying to go take pictures of everything on the list by the end of today I decided to use some pics I already have saved. Next week I will take on the challenge of shooting new pics. Some of them have more than one picture because I couldn't choose! This picture made me think of the idea of comfort. This looks like the most uncomfortable spot ever, but the homeless man finds comfort nestled up in those stairs. This is one of my fave pics ever. 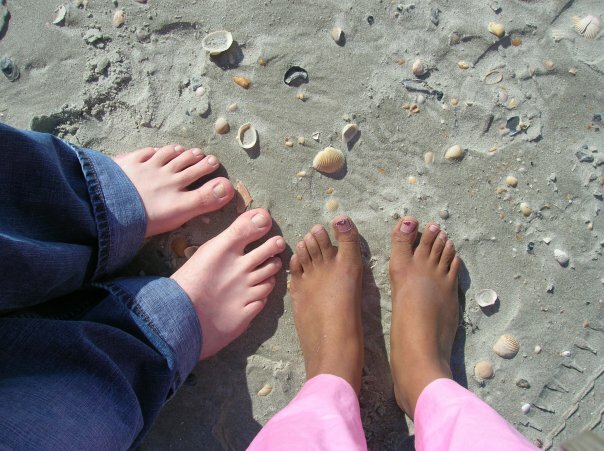 It was taken in Myrtle Beach and it is a picture of my fiancee's feet and mine side by side to see the contrast of our skin, and the seashells surrounding our toes. Me in my new glasses, enjoying the sense of sight. I like my big grin and that it is a close-up. I am discovering the world of interactive blogging groups that I can join, where we all can make 'common-ground' recipes and be amongst other foodies who have the same love and passion for food as oneself. I love the idea that there are so many other people out there who love food like I do! And we can share the experiences together, in a cyber world kind of way :) But even if we never meet each other or know each other's real names, and we may be on total opposite sides of the world, but we are all connected in some way by food. 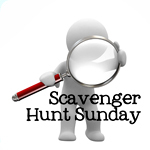 So I have been really excited to participate in some groups that I have come across, and the first was Souper (Soup, Salad & Sammies) Sundays over at Kahakai Kitchen. I don't usually make soup so I thought this would be a good time to broaden my horizons, and I had been eyeing a recipe of Reeni's over at Cinnamon Spice & Everything Nice. It has everything that I love - potatoes, cream cheese, and bacon. That is why it is called Potato, Cream Cheese, Bacon & Chive Soup. First, chop Yukon gold potatoes into 1/2 inch cubes. In a large pot, add diced onion and saute in oil until tender. We left out thyme because my fiancee doesn't really like it, and I didn't have any. Season with salt and pepper. Then add the potatoes and chicken broth. Simmer for 20 minutes until potatoes are tender. Remove 2 cups of the potatoes and puree with a blender. Add the pureed soup back into the pot along with the milk, cream cheese, Parmesan cheese, chives and bacon. Bring to a simmer and stir the cream cheese into the soup as it melts. 1. In a large heavy bottomed saucepan saute the onion in oil until soft and tender, season well with salt and pepper. 2. Add potatoes and broth. Simmer for 20 minutes until potatoes are tender. Carefully remove two cups of the potatoes and puree with a blender/immersion blender. 3. Add the pureed soup back in along with the milk, cream cheese, Parmesan, chives and bacon. Bring to a simmer and stir the cream cheese into the soup as it melts. Season to taste with salt and pepper. Serve. *An easy way to 'chop' chives or green onion is by snipping with kitchen scissors. First Watch understands my love of breakfast food. I hate waking up early, but I love breakfast food! Their kitchen is in the back of the restaurant behind the booths and tables, see for yourself. It wasn't too busy but there were a few customers. My kinda place. Quiet and relaxing. When I was here, there were only male servers. My server Michael was extremely pleasant and accomodating. He gets a thumbs up for customer service! I got overly excited when I looked at the menu - breakfast items galore! Omelets and pancakes and crepes, oh my! I wanted to order everything on the menu. Oh yeah, and they have a lunch menu also for you non-breakfast peeps (sandwiches, salads, and wraps). But my mind was on breakfast. My recent addiction to avocado is what influenced me to try the Bacado Omelet - a combination of bacon and avocado in a fluffy omelet served with sour cream and salsa, as well as their potatoes and an english muffin. Unfortunately, the only thing I really enjoyed was the english muffin with some strawberry jam on top. The omelet was a disappointment - there was barely any bacon in it, and the avocado looked brown in parts and tasted strange which turned me off a bit. I wasn't impressed. I think I could make a better omelet at home. Here is a closer look at the omelet.... all the fixings to be perfection, but it just wasn't. And I usually love breakfast potatoes, but these were just not crispy enough and were also somewhat cold. What a disappointment! Now let me explain so that I am not labeled a contradictionist - I am going to give this a rating that I liked the restaurant, because I like the idea of all that breakfast food, and the setting is comfortable and relaxed, and I want to try other menu items. It was not so horrible that I would rate that I disliked the restaurant. Many of their menu items sound delicious, so I would definitely give it another try. 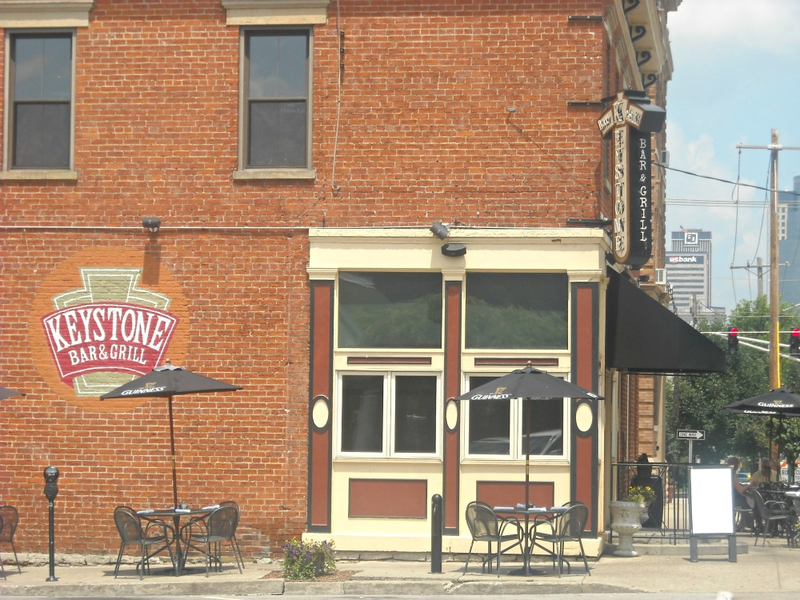 Keystone Bar & Grill has become our company's go-to place for celebrations, drinks, and even not so pleasant events like saying goodbye to co-workers who have moved on to different opportunities. I can go here in a large crowd or just for a quick lunch by myself. I have been here so many times, but I usually order the same things in rotation. But they have such an extensive menu that there are great options for everyone! If you are a human being, there has to be something here that you can enjoy! One of my usuals at this bar and grill is the Grilled Cheese Sandwich with cheddar, Swiss, and American cheese on toasted wheat bread with a side of key lime chipotle aioli, and I add bacon for an additional charge of $1.50 (for a total of $7.50). I have wrote of my love affair with sauces before. Here I am again in another love affair with another sauce, this time the key lime chipotle aioli. It is amazing. I seriously could eat this on or with anything! 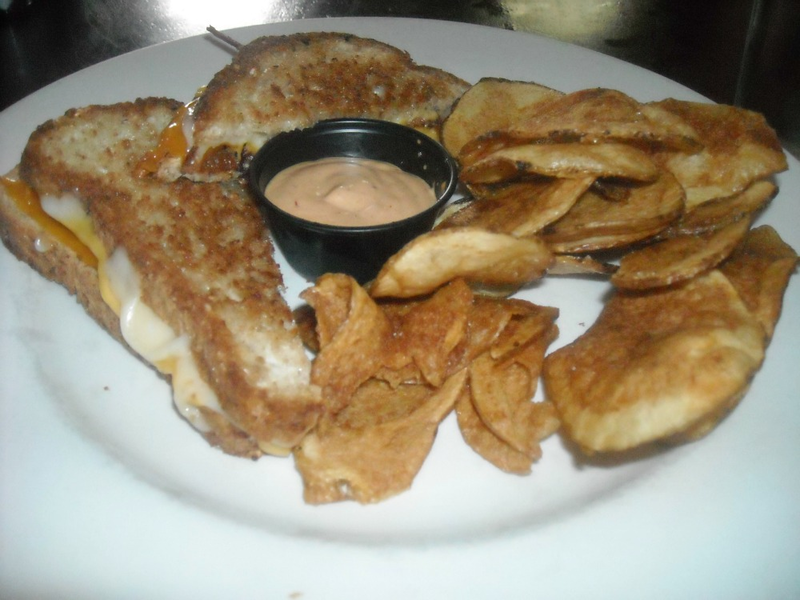 I think that is why I continue to order this simple but jazzed-up grilled cheese - because of that dipping sauce! I forgot to mention that their homemade Keystone saratoga chips are great as well, especially dipped in their smoky homemade BBQ sauce. I wonder if they sell this sauce by the bottle.... If not they SHOULD! They could make some more money from me! Maybe one of the main reasons that I love Keystone is that they have.... wait for it.... Mac & Cheese Mondays, and Quesadilla Tuesdays! That means half off all mac & cheese options on Mondays, and half off all quesadillas on Tuesdays! What's not to love?! So of course they are super busy on those two days. Dine in may take longer than usual, and calling in a pick up order has also been a lengthy wait of 40 minutes! Everybody wants some of it, what can I say? I have tried the Pink Floyd Mac & Cheese, which has bacon and carmelized onions. It was just ok... I found myself yearning with envy for my boss's Buffalo Springfield Mac & Cheese which has buffalo chicken topped with crumbled blue cheese. I went back several weeks later to get my own.... Don't you wanna go now? There is alot of food in that crock, don't let the size fool you! And it comes out to be a pretty cheap meal! Their quesadillas are also delightful - there are so many options to choose from on this end as well. I usually just get the Classic Quesadilla and add chicken for $3.00 more. So on any day but Tuesday, a Classic Chicken Quesadilla would be $10.00, but on half price Tuesdays it would only be $5.00! I love the jalapeno-cheddar tortilla on this thing. I have also tried a couple of other menu items but they weren't my faves. I've had Scotty G’s Philly Steak and I thought it was pretty good. I haven't really ordered it again because I found other things I like better. But I did enjoy it though. At one time, I ordered a burger (I can't remember which kind!) but I did NOT like the meat at all. It seemed to have little white pieces of grit in it. So I have not ordered a burger since, but a few weeks back my friend did order the Patty Melt and it did look tasty. Maybe I shall give it a try.... A few of my co-workers love the Buffalo Chicken Wrap... I have tried it before and it was all right but not my favorite. We also had a going-away party here and ordered the Dip Sampler from the Pub menu. It isn't available at lunchtime, though. I thought the trio of dips were good - spinach & artichoke dip, beer cheese, and roasted red pepper hummus. But since we usually go during lunch time and that was a rare after-work occasion, we usually can't order the Dip Sampler. One thing that I didn't really like (but I see the potential in it) was the Grilled Chicken Sandwich. I ordered it because it came with that key lime chipotle aioli! It wasn't enough to make it better unfortunately. The chicken was grilled black and hard and crusty. They tried to put the burnt side down but I could taste it, and flipped the chicken to find a scorched piece of meat. I would probably order it again and just hope for no burntness! They have an upstairs area for parties with a crowd, or just an area for dining with a big group. There is also a shuffleboard upstairs which is really fun to play on while waiting for food. Another thing that I love about Keystone is their display of local artwork. Yes, they have old Hollywood art on their walls in the main dining area. But if you go back to the hidden section (still on the first floor), here is where they display the local art. I enjoy it so much! I have taken two artists' cards while at Keystone. The work of Mike Maydak is currently on display here. He does comic-like paintings, some of which are Covington monuments and buildings. I also loved the artwork of Robin Ewers - awhile back her celebrity paintings were on display at Keystone and I loved them so much! She also does portraits, pencilwork, and more! Check out both of these young artists' work! 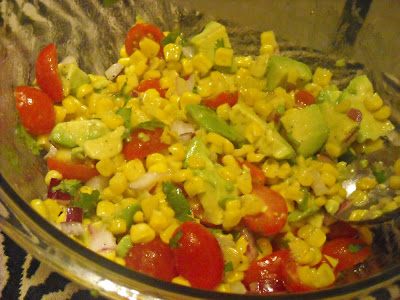 Yesterday evening I made Corn, Avocado, and Tomato Salad. I have recently found a love for avocado, or guacamole I should say. It was simple and required barely any cooking (besides the corn). Combine the corn, avocado, tomatoes, and onion in a bowl. In a large glass bowl, mix together the dressing ingredients. Pour over salad and toss gently to mix. I am submitting this to Foodie Fridays over at Designs by Gollum, and to Souper Sundays over at Kahakai Kitchen. Join in on the fun! This just may be THE easiest side dish ever created. I first tried this at T.G.I. Fridays when it was served as a side with my Parmesan-Crusted Chicken. Instead of the usual Caprese salad, it had grape tomatoes and cubed mozzarella rather than sliced. I enjoyed it so much that I HAD to be able to make it at home. I have no clue if this is how they make theirs, but this is how DESI makes it! Well the obvious is that I needed tomatoes and mozzarella. Good guess, Des! So first I chopped about 6 oz. mozzarella into cubes. Then I halved about 8 oz. tomatoes and seasoned them with salt and pepper. 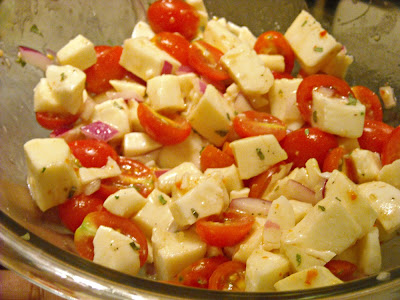 Next I diced about 1/4 cup of onions and put the tomatoes, cheese, and onions in a large bowl. Then add some chopped basil (I use Litehouse freeze-dried basil). Here comes the marinade part - add 3 tablespoons of Italian dressing to the bowl (I use Kraft Zesty Italian) and mix everything together. Marinade in the refrigerator until ready to serve. 1. Cut your grape tomatoes in half and put in a large bowl. 2. Chop mozzarella cheese into small cubes and also add to large bowl. 3. Add 1/4 diced red onion to large bowl. 5. 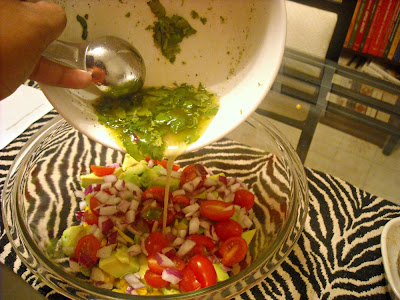 Add 3 tablespoons Italian dressing and mix together. 6. Let marinade in refrigerator until ready to serve. WWDB? = What Would Desi Buy? Alcohol makes all of us happy. Ok maybe not all of us but most of us. Ok maybe not most of us but some of us. Ok maybe not some of us but mainly I am talking about myself. 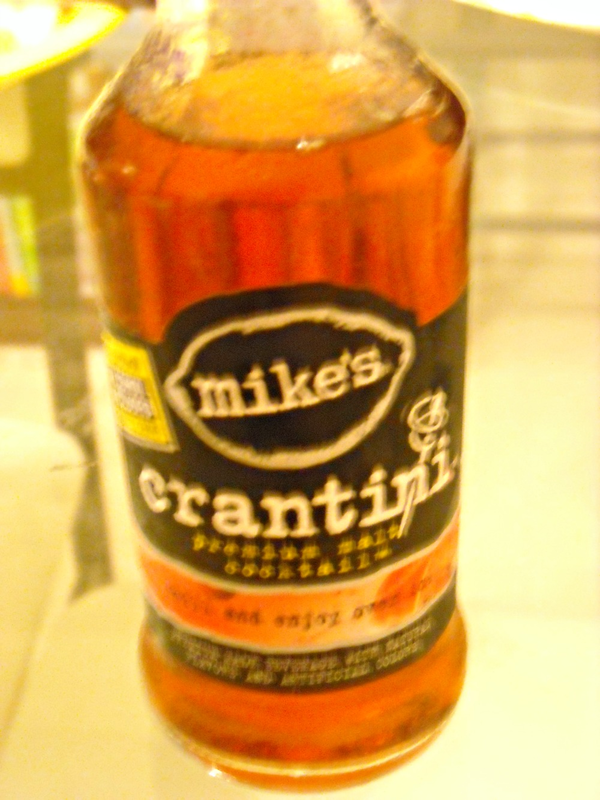 I normally don't get these Mike's Hard Lemonade drinks anymore. They were so high school (underage drinking is not promoted here!). Now I need stronger drinks with MORE alcohol. But these were on sale at my liquor store for reasonably cheap so I thought I would try them. I love mixing vodka and cranberry juice, so I figured I would like these. Make sure to serve them extra cold! They aren't better than the real hard vodka stuff, but for a little mixed bottle drink... it was pretty tasty. It all started with the basic Mike's Hard Lemonade but has expanded. This is one of their premium cocktails. They come in packs of four, from what I have seen. In the premium cocktails collection, they also offer pomegranate martini, screwdriver, lemon-drop, mike-arita (like a margarita I'm guessing? ), and mojito - all of which I need to try! Their website also says they sell Mike's Harder Lemonade and Mike's Harder Cranberry Lemonade, as well as Classic Margarita in traditional lime, raspberry, or peach flavors. I want to try but have not seen Mike's Hard Mango (or Pomegranate) Punch. They also make a tea version - Mike's Hard Tea (and Hard Light Tea). Well, that's all for now. Can't wait to enjoy one of these after work. Ever since I was a young girl, I have loved Long John Silver's. Something about their grease-covered fried fish and shrimp keep me coming back for more. Growing up in the Lockland area, my mom used to drive to Tri County just to get me some Long Johns. Thanks, Mom. You must love me. So I'm sure one day I will pass my love of Long Johns onto my children. It's a tradition! A requirement to fit in our family. The one in Newport is connected to a KFC. Fried fish, and fried chicken. Both good choices. Sometimes it is hard for me to decide if I want one or the other. I usually go with Long Johns because in my head, if I ordered KFC, it would just taste like fried fish anyways. But good idea whoever decided to put these two together. Well, good and bad for me. Good because it tastes so good. But bad because, well, I fear I will die an unpleasant death by fried-ness. I drove here for a quick to-go lunch and planned to devour it in my car before running a quick errand at Kroger. Today I decided to get 3 shrimp and 1 piece of fish (both $1.49 each). You see those crispy delights hidden underneath my shrimp? I like to call those "crispies", and I like to have them in my belly. One time, I even went there to order just a drink and a box of "crispies." The strange thing is that when I ordered it, the cashier didn't even looked phased. Like they were used to people ordering greasy fried batter. Hey, and it didn't even cost anything! They also have very good chicken, and hush puppies. I am not big on their fries because they usually taste too much like fish and not fries. One time I also tried those breaded lobster bites, because um I love lobster. But I was not likin' those! I'll stick to the real thing. I have gone to the Newport Long John Silver's so many times in the past 2 years since my job moved to Covington, that they know my voice when I pull up to the intercom. 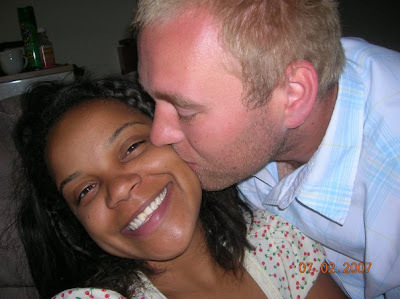 I have "befriended" a nice blond girl, as well as a thin black woman. I mean after seeing those two as often as I do, I feel like we know each other and have some other kind of relationship that goes beyond the drive-up window. They know what I want. And they know I want tartar sauce. Lots of it. I feel so special! And yet I wonder why I'm so fat chunky enormous thick, probably from 20+ years of eating fried batter! Bye, bye Subway - hello Nick & Tony's! I have been waiting for a restaurant to open up in the old Subway on Scott St. right by my work. I love close, convenient places where I can just grab my lunch and go. So a couple of weeks after they opened up, I decided to try them. I mean, double deckers are always good! Now I'm not gonna lie, it is a little strange to me that they still have the same Subway equipment in there such as the toppings cooler and drink machine. Boy oh boy I hope they sanitized all of it to health code standards! But enough of the nasty thoughts. Even though there was only one couple in front of me in line, it seemed to take quite awhile for my food. 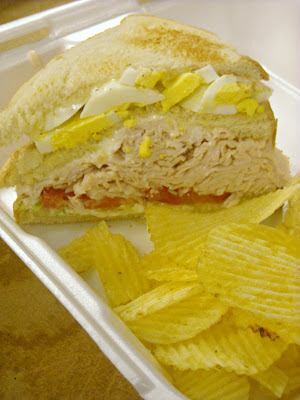 I ordered a turkey and boiled egg double decker with tomato, lettuce, and mayo. It is $5.25 for a double decker. It is alot of meat though! Too much for me to eat at once! I have been back since and got a single decker for $4.25. These sandwiches come with chips. I asked the cook if he made the bacon in the microwave (because I hate microwaved bacon and need to know now if I will ever eat bacon from there) and he informed me that he bakes it in the oven on a sheet pan. I have never baked bacon, so I would be interested to see how it tastes. It HAS to be better than microwaved bacon. YUCK! They also have hot sandwiches (like gyros, reubens, etc. ), wraps, soups and salads. Unfortunately, though I like the food and convenience, I have boycotted them for awhile. I got very sick after eating there one day. Who is to say if it was because of this place or not? Certainly not me. You know how you are just a little nervous about going back even if you know that may not have been the cause? I'm sure it doesn't help that I have a fear of the whole Subway stuff still being in there. So just in case it was the cause of my sickness, I am taking a break from them until I just feel better about going. One day I know I'll be up to going again, but until then.... I'll miss you, Nick and Tony! Whoever you are. Don't take it personally! Restaurant Review : Burrito Joes - Downtown on 4th St. Ever since I started blogging, I have been more open to trying restaurants that I normally wouldn't try. I used to work at Dillard's Salon in Tri-County mall, and there was a Burrito Joe's in the food court that I NEVER went to. That was before my blogging days :) I am not big on Mexican food as it is, except for Chipotle of course, which I'm sure many would not consider 'true' Mexican food. 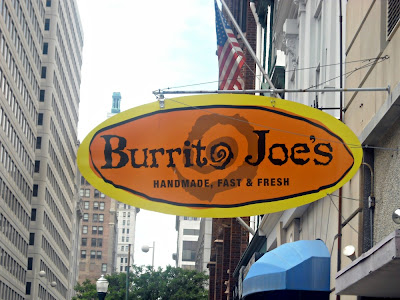 So when my coworkers mentioned traveling across the bridge back to Cincy and hitting up Burrito Joe's on 4th Street, I was half hesitant half excited. Parking of course can be a BLEEP, but we finally found a meter on another street and walked there. Being in the downtown setting did bring back some good memories and feelings though. All the bustle, all the people! I found myself wondering if they had burrito bowls like Chipotle. But then I told myself to snap out of it! Be open to something new. Upon entering, I saw that they have burritos (obviously! 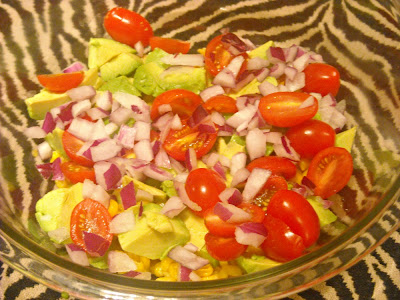 ), salads, tacos, and nachos. No Bowls :( But that was ok, it forced me to try something else :) I opted for one of their specialty burritos - the Southwest BLT Burrito. It had bacon, cheddar and pepperjack cheese, lettuce, tomatoes, onions, and a side of black bean salsa. The salsa wasn't anything special. I much prefer the corn salsa from (sorry to say it, AGAIN!) Chipotle. I thought there was too much bacon. And I love bacon. But there was just too much. 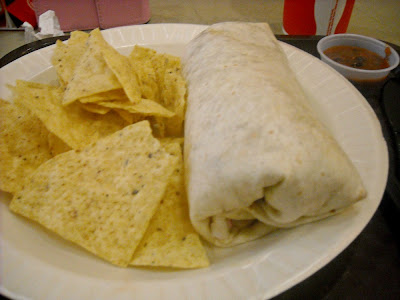 It overpowered the burrito and had me wishing I had ordered a chicken burrito instead. And there was no guacamole for dipping my chips, (like that one place) so they were just pretty plain. So overall I wasn't very impressed. My coworker tried the Buffalo Chicken Burrito, but unfortunately only got a tiny bit of chicken and an overwhelming amount of sauce, basically a liquid burrito! The blue cheese-celery slaw that comes in it sure does sound tasty, though! Sorry peeps, I'm still a Chipotle-lovin' fool! Sorry if my non-Mexican eating habits bother you, I know everyone loves Mexican food. 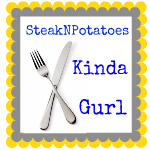 But this steak and potatoes gurl isn't a fan of blah chips, liquidy salsa, lackluster burritos, and odd random decor. Blogging has become a new obsession of mine. I love checking out fellow cooking blogs, getting inspiration from them as well as new ideas that I would never have thought of doing! 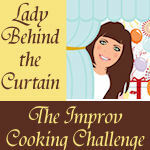 I was doing my daily blogging check-ups and came across The Sporadic Cook's blog, which I am following. She had a great idea to ask several "sporadic questions" and I thought I would answer them now! One day I was just surfing the web for recipes, and I happened to come across a food blog on google. That blog was Krista's Kitchen. I had never even heard of food blogging until Krista. And I was just so amazed that people were doing this, and that there were so many people who also shared a love of cooking like I do! She was my inspiration to start blogging. Her blog keeps me coming back for more, and not only is she a talented cook but also seems like a great person. She has helped me jumpstart my blog on numerous occasions. I always look to her for help because she is the reason I started blogging! 2. What's your favorite thing to make for a crowd? I haven't really had the pleasure of making alot of meals for a crowd. A couple of times we have prepared a fancy dinner of scallops and filet mignon for our family and friends. But I would say that my favorite thing to make for a crowd would be something easier, like peanut butter cookies (football-shaped for Super Bowl), or a trifle of some kind. 3. What's your favorite thing to make for just you? I am a lover of breakfast food! My fiancee likes a breakfast sandwich... it has to have the bread, he never wants just bacon or just eggs or just sausage. So I like to make myself some bacon, cheesy scrambled eggs or an omelet, and sausage patties when I am home alone on the weekends sometimes. 4. If you could invite 3 famous people (living or dead) to dinner, who would they be? Any particular reason? This is just a spur of the moment answer (I am sure I could think of a million more possibilities, some that would even be better than my original choices). 1. Aaliyah (deceased singer) - I wanted to be like her when I was growing up. She was one of my childhood idols, and I would have loved to meet her. 2. Oprah - It would be fun to make a dinner for her and to have a wonderful discussion over dinner, about anything and everything! 3. Tupac - Interesting conversation, I would ask him about his music and what inspired him. I would ask him about his "beef" with Biggie. 5. When you think of your childhood, do any favorite dishes come to mind? Sausage, boiled egg, and corn casserole that my mom used to make me. It was so good! I have yet to make it myself as an adult. My mom also used to make me the best grilled cheese sandwiches. She also used to make delicious "corn-a-chian" or so I thought she was syaing lol! My mama is from Harlan, KY so she has the Southern twang to her voice sometimes. So all my life growing up, I thought she was calling it "corn-a-chian" [pronounced something like that?!] But really it was just cornish hen. lol. Love that woman. Another is a frozen meal she used to make me - some kind of frozen au gratin potatoes with ham pieces. I have not found another kind that can compare. And she doesn't remember what brand it was :( So I am on the hunt for them! 7. What's your favorite part of blogging? Do you think you'll keep doing it for a while? I kind of already answered this question, but I love to check out my fellow food bloggers' recipes, and I like to share my opinions on recipes and restaurants. 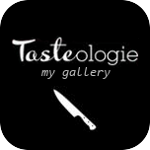 I also have always loved to write, so blogging showcases my love of cooking and writing all in one. And I plan on blogging for a long time. I can't wait to earn more followers, make many more recipes, and watch my blog build over the years and be able to see all of the improvements I've made. I go back and forth between liking and being disappointed in Skyline. When I go long periods of time without eating it, I can appreciate it more. But, I realize that I go long periods without eating it because it doesn't urge me to come back again and again. Like some restaurants do. Some I can't stay away from! Now, I didn't take any pics. All I ordered was a 4-way with onions. I figure we all know what a 4-way looks like. Piled high with some cheese of course. 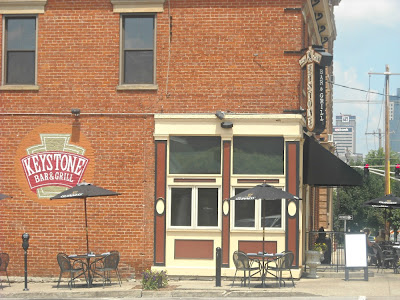 A few coworkers and I went to the Mainstrasse location for lunch today. Yes, we have to hop in the car and drive a couple of blocks. But it's worth it to get a little more peace and quiet (and better service?) than the Skyline on Scott Blvd. That one is usually packed because it is in the heart of some Covington businesses. The one on Mainstrasse has seemed less crowded when I have been. And considering that the last time I dined at the Skyline on Scott Blvd. there was a waitress yelling and arguing with her boss in front of customers, I don't have a great urge to go back there very often. So yes, the 4-way was pretty good. Their crackers are tasty to snack on while waiting. But now my tummy aches as I write this post. Skyline always makes me feel gross, bloated, nauseous, and that I reak of onions and cheese all day long after I have eaten it. Today was no different. So at the time it is good, but I suffer later. Dixie Chili is a Northern Kentucky chain - they have locations in Newport, Erlanger, and where I dined for lunch... Covington. I had never been here before, but had heard about it from coworkers. I have tried Covington Chili, and of course the Cincy Skyline and Empress Chili as well as Gold Star. 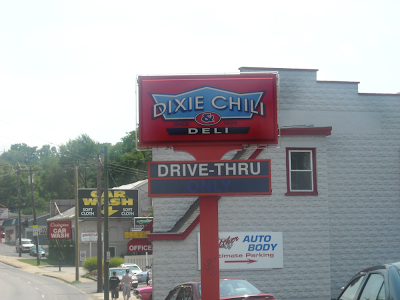 I have formed my opinions of the others, but Dixie Chili was yet to be tested. Until now. and a Chili Cheese Fry, which I got uber excited for because they were waffle fries instead of the usual thin (or crinkly) fries. I LOVE waffle fries, so I had to try them. They were good, except I wasn't a big fan of their chili. And considering that I ordered two items with chili on them, I wasn't too impressed. The waffle fries are a good idea, I just wish I had them with a different chili on them. For the price, I wouldn't really say it was worth it. Of course, the sandwich isn't too pricey. But like most chili places, those chili cheese fries are overpriced! Especially when I didn't like the chili!! And oh yeah, they have red cream soda! Um, I love it! Not many places have this as an option, so they get a thumbs up for that :) It also goes along with the whole old-fashioned diner feel. Good old red cream soda. It doesn't have to be Friday for me to go to Friday's. It is a good go-to place to eat when we have money to spend but not enough to go to an expensive restaurant. I have dined in at the Western Hills location once or twice, but we usually get it to-go when we go to this one. I have been here many times and actually have joined their Give Me More Stripes club, where I can earn free food once I have spent $100 at the restaurant! Everytime I go, I just have to have them swipe my card and it adds on my points - a point for each dollar amount spent. I figured this would be a good idea considering we dine here often. There are no enrollment fees or anything like that. I also have signed up to receive their emails, and I often receive coupons for free appetizers/desserts from there as well. But anyways, this particular time that we got our to-go order, I received a free appetizer and decided to get the Southwest Chicken Quesadillas. These had spicy chipotle chicken in a tortilla with Monterey Jack and cheddar cheese, with a side of salsa, pico de gallo, lettuce, and sour cream. It was nothing to rave about. I wouldn't pay money for it, but since it was free it's all good! For my main course, I ordered one of my usuals - from their Right Portion, Right Price menu, the Parmesan Crusted Chicken. Not to be confused with the SIZZLING Parmesan Crusted Chicken which comes with a different side. I accidentally ordered the Sizzling Parmesan Crusted Chicken before, and it came with a side of some kind of angel hair pasta with tomato sauce, which I did not like at all! It in no way shape or form compares to the tortellini and tomato-mozzarella salad, in my humble opinion. My Parmesan Crusted Chicken comes with a sauteed chicken breast coated with caesar dressing then topped with a parmesan crust. It comes with a side of three cheese tortellini with spinach alfredo sauce, as well as a tomato-mozzarella salad, which I have made a copycat recipe of. I like to have a variety in my meal, so I love to be able to switch between bites of savory chicken, comforting tortellini, and fresh salad. I order this ALOT, so obviously it's good! My soon-to-be hubby ordered the Jack Daniel's Burger, a variance from his normal Jack Daniel's Chicken Sandwich. This burger is glazed with a little Jack Daniel's sauce and comes with bacon (YUM! ), provolone cheese, lettuce, tomato and onion, with a side of Jack Daniel's sauce. They also throw in a few fries for you. Sometimes they are soggy, sometimes crisp and fresh! It's a hit or miss situation. I tried a bite of that burger and boy was it delicious! Maybe it's just that sauce - I really think it can make anything good. 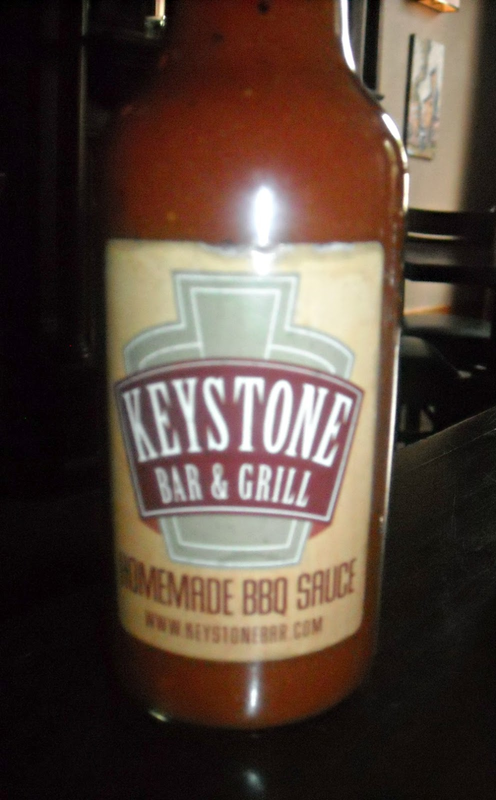 I have a love for good sauces. They make plain food come to life! Another appetizer that I love is the Sesame Jack Chicken Strips. I get them with the sauce on the side so the skin is still crispy. They are so good! I have also, in the past, ordered the Gourmet Mac and Cheese which came with a grilled chicken breast and an assortment of cheeses (that's what made it "gourmet") but now I am not seeing it on their menu at all! I will be distraught if they no longer offer it!!! I can also recommend the Sizzling Chicken & Cheese, which I used to order religiously. I have tried the Prime Rib Stroganoff and I was NOT impressed. The meat wasn't anything great and I just found myself yearning for my usuals. That's what I get for venturing out and trying new things! Just kidding. Many times that is why I stay in my comfort zone and order the same thing every time since I know that I like it. That's why I like blogging - it urges me to try meals I normally wouldn't try, as well as restaurants that I may not normally explore. Dessert-wise, I have tried their Brownie Obsession multiple times and I don't think it could ever be nasty. They don't have too many options anymore, they got rid of some of them. But recently I had a coupon for a free dessert and decided to try their Chocolate Peanut Butter Pie for the first time. It was very good! Friday's should really be called Thank God It's [Every Day of the Week] because I could eat it every day of the week, not just on Fridays! How can a place with not very many options keep me coming back for more? Great food. You don't need many options when you have one go-to meal that you could eat anytime, all the time. That, for me, is Tazza Mia's pot roast sandwich. Located near the Rivercenter Building in Covington, Tazza Mia serves breakfast and pastries, a selection of coffee drinks, and salads and sandwiches for lunch. For $7.50, you can enjoy a lunch combo which includes a sandwich, chips or fruit, and a drink. Like I said, I usually get the pot roast sandwich, which has juicy pot roast, roasted carrots, mushrooms, swiss cheese, and chipotle mayo on garlic panini bread. The carrots really add a nice flavor to the sandwich. I love chipotle mayo, all the time, on anything! And the bread is very good as well. They also offer a salad bar with many topping and dressing options. You can add meat to your salad for an additional charge. I tried a salad once, but it wasn't anything special. I also have tried the Chicken Pesto Panini, and it was only ok. It was served on a ciabatta bread, and though I liked the bread it just wasn't as good as the garlic panini bread. My co-workers enjoyed the Chipotle Turkey Bacon, but I didn't like that so much. Tasted like microwaved bacon, which I am so against! I haven't been there in about a month, and upon entering I noticed that they now have a frozen yogurt machine with fun toppings! How fun! I can't wait to try some of that frozen yogurt! Their pastries also look very good and I have yet to try those. No other pot roast sandwich compares to Tazza Mia's. Theirs is the best. Others may try to compete but they don't even come close. Tazza Mia is a very good place for lunch, you should definitely check it out if you are in the Covington area.